God is in the details. (I also think he's hiding out in sublime peppery olive oil, Hog Island Kumamotos, Old World reds, the ankimo at Sebo, hot coppa, and the black magic cake my mother makes me for my birthday.) Anyway, before I get too lost playing the "what I want for my last meal on earth" game (and I love that game), it still shocks me when some folks open restaurants and didn't seem to think very much about the details inherent in what they were creating. I mean, come on, you want people to visit your (hopefully) special restaurant, get turned on, talk about you, and come back again and again, but you opened before you even figured out your wine program. It's like some folks are hoping for a restaurant god to come down from the sky (or pop out of a bottle of chartreuse) and help write their menu, launch their website, crunch some numbers, and train their staff. Boggles the mind. Then you have a place like ~SPORK~, created by people who obviously thought a great deal about what they were doing. The concept is creative and the whole look and brand are tight, kind of the way Range struck me the first time I saw it--it was like, "Hey, some people with taste made some decisions!" And if you are going to open up a restaurant in a former KFC, like Spork did, you better have some vision. Like, X-ray vision, and maybe some "I can see the future like Christopher Walken in The Dead Zone" vision wouldn't hurt either. It's no coincidence that the talented Eric Heid of Martin Heid Design did both Spork and Range's spaces--he's also slated to do the new Slow Club in Dogpatch. Spork's style is kind of blue collar-hipster cafeteria-meets-modern industrial-prefab chic. I dug it. The 50-seat room is all open (so yes, there is definitely some room buzz), with banquettes and low-backed booths outfitted in a soothing dove grey, a row of four old-school fans whirring above the kitchen, a curving bar/diner counter outfitted with pegboard, fun two-tops along the window with Edison-esque bulbs on poles, and punches of color from the Herman Miller fiberglass orange and yellow stacking school chairs and the bold propaganda-feeling art on the walls (it was originally a vintage service station billboard that was cut down into pieces). Speaking of service stations, one thing I feel like someone forgot was the bathrooms--votive candle or not, I felt like I was suddenly on the I-5, taking a pit stop in Coalinga or something. The room's light is glowy, the music is eclectic cool (from Tricky to Beck to hip hop), and the servers are all cuties with outfits reminiscent of hot mechanics (the dudes) or cheeky flight attendants (the chicks)--and yay, our server was totally on her game. The compact Cal-American menu is clever, with little nudges and winks, Lindy (hip) Hopping between comfort and au courant. Start with the tender dinner rolls and honey butter ($3) for an example of "retro is now." Ditto on the supple gnocchi gratin ($8), which was like a grown-up mac 'n' cheese, rich with bacon and béchamel--it came with a spork, handy in scooping up the decadence. I was told the plan is to have dishes rotate fairly frequently, so we were happy to play guinea pig to a couple new dishes, like hamachi with a dollop of yuzu sabayon ($11) that totally did a fun little prickle in your mouth once the wasabi sidled up to the citrus. We also played around with the goat cheese croquettes ($8) resting on thin slices of mango, with sprigs of watercress, and a few drops of sherry vinaigrette. The disparate texture-temperature game in this dish one divided our table: 2-liked it, 1-not so much. There are just five mains to choose from, which included the mussels avec spork ($15). Unfortunately the provided spork didn't prove to be very useful when eating this gutsy-flavored dish--one of those moments when the concept/cute name tried to trump common sense. I just wanted a fork and knife. The bread proved to be the best device to sop up the smoky Anchor Steam broth (it usually is). This dish was actually a little clunky to me--the carnitas pork was mostly in a big hunk, while I wanted to enjoy pieces of it with each bite of mussels. The cilantro also needed to be de-stemmed--otherwise it's only as good as garnish. I know some folks who are diggin' the "between the sheets" ($16) dish, which reminded me of an upscale vegetarian Stroganoff, with mushrooms, truffle cream, and cheese. It was too much pasta for me--call me a purist, but I would have preferred regular noodles instead of the thick swaths of pasta sheets--I'll save the sheets for beddy-bye later, thanks. Now for another "re/constructed" dish: the much buzzed about in-side-out burger ($14) with "smashed fries" (they are cooked, then smashed and fried up crispy-like). You totally have to fork and knife this one, so no sporking here, although you'll definitely be porking it. You get two juicy and perfectly cooked patties that sandwich a half of a grilled burger bun in the middle--there's a dollop of caramelized onion and melted cheddar on top, and a thick slice of tomato and crisp butter lettuce underneath the tower of power. It's beefy and big and messy and mighty delish, but as a chef once told me, you can't be a restaurant known for your burger. (Well, unless your name has burger in it and that's all you sell.) 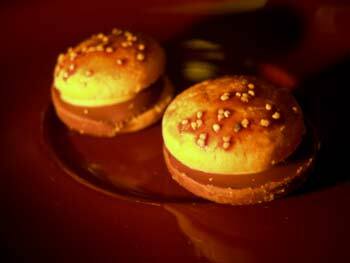 On the burger tip, the Lilliputian chocolate and sesame burgers that come with the check are also mighty cute. Other items we didn't try were a sea bass dish ($19) that looked rather refined, and then the homey turkey ($18) with mashed potatoes and gravy. See how the menu feels like a family with a few random stepsiblings, but it's still a family? When executive chef and partner Bruce Binn originally told me about the concept, he called it "short order fine dining." One minute you've got a sabayon, and the next you have smashed fries. Binn hails from all kinds of SF faves, like Slow Club, Postrio, Citizen Cake, and most recently, Delfina. He also worked in NYC at Batali's Lupa and David Bouley's Upstairs. His background has bred some confidence about making pasta, so I'm sure a few kinds will continue to have their place on the menu. Dessert included the pot brownie ($6)--duh, of course we were going to try it. It was pretty much what it said it was: a brownie in a petite-lidded pot, topped with vanilla gelato. We also had some exquisitely fresh strawberries ($6) with a hint of balsamic resting in a cloud of boozy mascarpone. NOW would have been a perfect moment for the spork! The wine list is as edited as the menu: six whites, ten reds, with four by the glass each; the most expensive bottle tops out at $46, a Cali Zin from Neyers. The crisp Cristalino cava comes in individual splits, cute. Six bottled beers, including a Chimay Grande Reserve (750ml) are also available. Neighborhood denizens will appreciate the Ritual Roasters French press on offer, but my favorite coffee-related detail was the usage of old-school orange-lidded decaf coffee pots as water pitchers. Spork feels like a natural addition to the neighborhood, nestling right in with its retro vibe and friendly price point, with enough quirk to keep people interested; it could easily become hipster HQ. I plan on returning and checking out what dishes get rotated in next--my ears are pricked. I wonder if some chicken will ever make a (rather poignant) appearance?